Looking for the best brad nailers to help you with your next home project? Or do you need to know how to choose the best brad nailer for your professional gig? We did the research and found 10 of the top brad nailers out there for just about any home improvement project, from laying flooring to framing out a new wall! Before you invest in one, though, here are a few key features you should know about when shopping around. Gauge: The gauge is the diameter of the nail that fits into the nailer. Make sure to choose the gauge you need for your project. Thinner nails are great for finishing, and thicker nails are best used as anchors and framing. Power: Brad nailers can be powered by three different methods: cordless, pneumatic, and corded. Pneumatic nailers run by hooking them up to an air compressor, cordless nailers use rechargeable batteries, and corded models use electricity from an outlet or power cord. Nail Size: In addition to the nail gauge, we’ll also let you know the length range of nails you can use with your new brad nailer. This allows you to use a variety of lengths for installing wall studs, flooring, or molding. Type: The brad nailers we reviewed come in both straight and angled versions, so you can choose the level of precision and control you need. Angled nailers fit into awkward spaces, and straight nailers give you firm control while working quickly. Weight: If you plan to use your brad nailer for long stretches of time, a lightweight model is great for working all day and reducing fatigue. Heavier models are great for taking on heavy-duty projects like installing roofing or wood framing. Warranty: Whether you plan to use your nailer for home or professional use, a warranty is a great thing to have. It ensures the company will repair or replace your nailer if something happens, so you can get back to work! So now that you have a better idea of what you’ll need, let’s find the best brad nailer for your needs! We researched several of the top rated brad nailer options to find 10 that we think are the best for a variety of projects, budgets, and skill levels. If you’re short on time, that’s totally fine! We started with our Top Pick and Budget Pick, so start there first. You can always come back later to read the rest! Our Top Pick is a brad nailer kit from DEWALT with everything you need to get started on your next big project! We think this is the best cordless 18 gauge brad nailer to buy if you’re a homeowner because it doesn’t require you to have an air compressor to use it. This kit comes with an 18-volt rechargeable battery and charging station that takes only an hour to fully charge! It also comes with a belt hook, safety glasses, and a plastic storage case to keep everything safe and organized. We also like that this nailer is easy to use, especially for beginners. It’s lightweight, and you can set it to either sequential or bump mode, giving you full control. You can easily clear jammed nails without extra tools, and it has a trigger lock that prevents misfiring. If you’re looking for the best cordless brad nailer for your home tool kit, this is a great place to start! Our Budget Pick takes us to our Ryobi brad nailer review, a favorite of ours we think homeowners will enjoy using around the house! 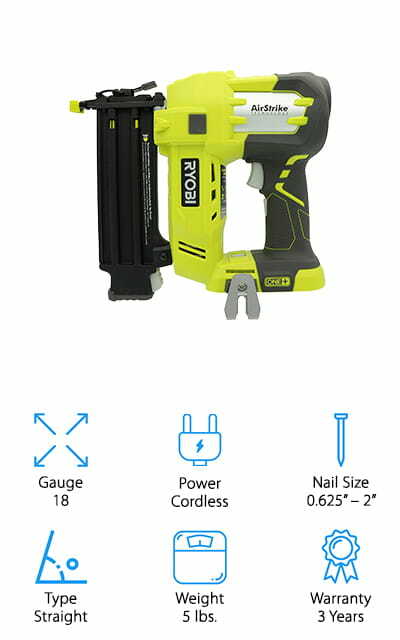 This inexpensive nailer runs on a lithium-ion battery that provides enough power to pound out 700 nails in about an hour! We like that this nailer is easy to use, and you can make adjustments or fix jams without extra tools. The nailer has a dry-fire shut off, so you won’t leave dents in your wood if you accidentally try to fire it without nails in the chamber. It also has LED lighting to help you see exactly where you’re nailing, even in dark spaces like cupboards, closets, and crawl spaces! We also like that this nailer is compact and only weighs 5 pounds, so you can use it on daylong projects without getting too fatigued! We think that this is the best 18ga brad nailer for the money because it’s efficient, compact, and easy to use! Next up is our pick for the best pneumatic brad nailer, a professional-grade nailer from Makita that both pros and home users will love! We like this nailer because it is incredibly easy to use! You can adjust the nail depth and clear out jammed nails quickly and without extra tools, so you don’t have to stop and go back to your toolbox every time something happens! The magazine can hold up to 100 nails, and it has a reload indicator to let you know when it’s time to add more nails, preventing dry firing. The rubber tips prevent you from scratching or denting soft wood surfaces, and the exhaust port keeps your area free of debris that could also scratch your wood! This is a great brad nailer for installing flooring, molding, trim, and other woodworking projects you have around the house! All you need to do is hook it up to your air compressor and get to work! If you want the best electric brad nailer that uses 16-gauge nails for your woodworking projects, grab up one of these lightweight and convenient cordless nailers from Porter-Cable! 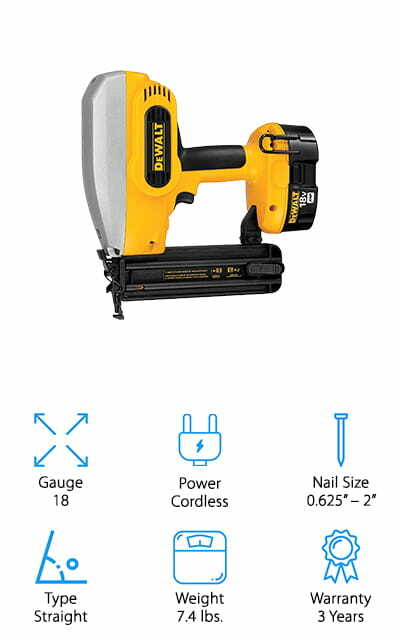 This battery-operated nailer can hold up to 100 nails that range in size from 1” to 2.5”, and it can nail in up to 1,000 nails with one charge! 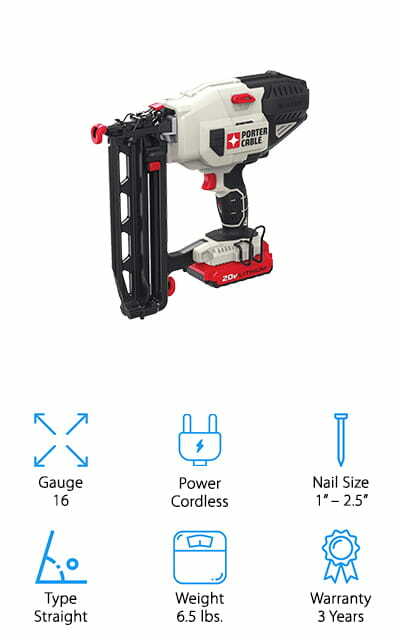 We like that this heavy-duty nailer is only 6.5 pounds and small enough to use one handed to maneuver into tricky spaces, making it perfect for installing cabinetry, installing trim, and much more. You can also make several adjustments to your nailer without needing extra tools, including removing jammed nails, restarting after a stall, and setting the depth! It also has an LED light that you can use to see where you’re nailing in tricky or dark spaces. This is the best brad nailer for woodworking projects all over your home or workshop because it is easy to use and easy to maintain! Next up in our search is this Hitachi brad nailer that both professional and home improvement carpenters will enjoy using. 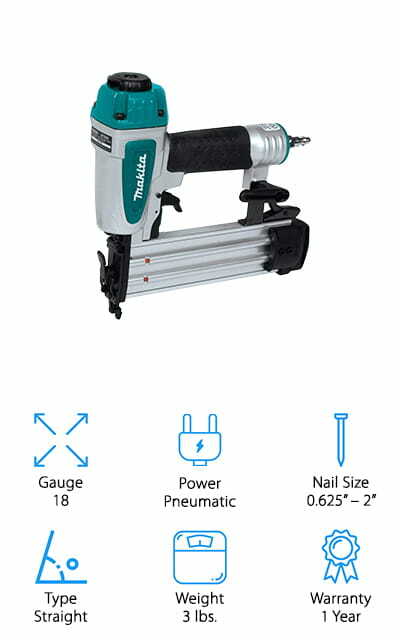 This 18-gauge pneumatic nailer is great for taking on woodworking projects large and small. At only 2.2 pounds, this nailer won’t wear your arms out too much, even after a long day of installing cabinetry, trim, or flooring! 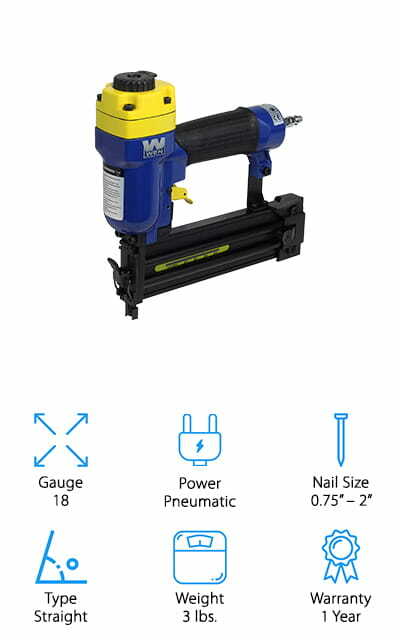 We like that this nailer can handle nails from 5/8-inch to 2 inches long, so you can customize the nails to exactly how you long you need them! You don’t need extra tools to do adjustments on this nailer, and you can clear jams quickly to get back to work. We also like that you can use this as a precision nailer or continuous nailing, depending on your project. The kit comes with a no-mar nose cap to prevent dents and scratches on surfaces while you nail, a pair of safety goggles, and a carrying case to keep everything organized and clean! 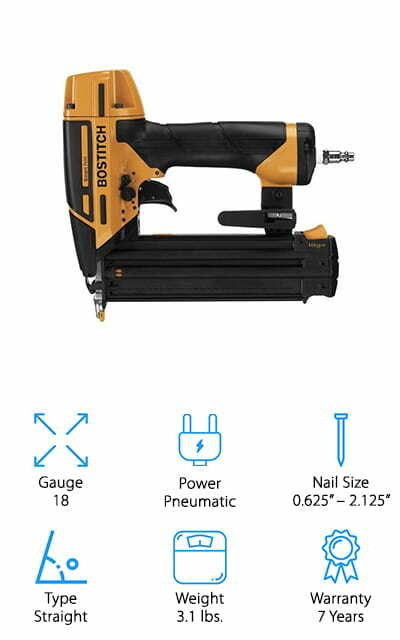 Another great option for a professional-grade brad nailer is the Smart Point Nailer from Bostitch! This is the best 18 gauge brad nailer for those of you who want precision and convenience without needing to spend a ton of money. We like that this nailer has a small tip, so you can see more clearly where you’re aiming for a precise hit every time. You can also set the depth to exactly where you want it with a dial, instead of grabbing extra tools to make your adjustments. We also like that this is an oil-free pneumatic nailer, so you don’t have to worry about keeping oil stocked up, constantly checking on the oil level, or worrying about leaving oil stains as you work! It also comes with no-mar pads to keep you from leaving scratches or dents in wood as you work. This inexpensive nailer is great for using on all of your home projects and woodworking tasks alike! Looking for a professional-grade brad nailer that uses thicker 16 gauge nails? This pneumatic brad nailer from NuMax is durable, easy to use, and can handle just about any job you throw at it! 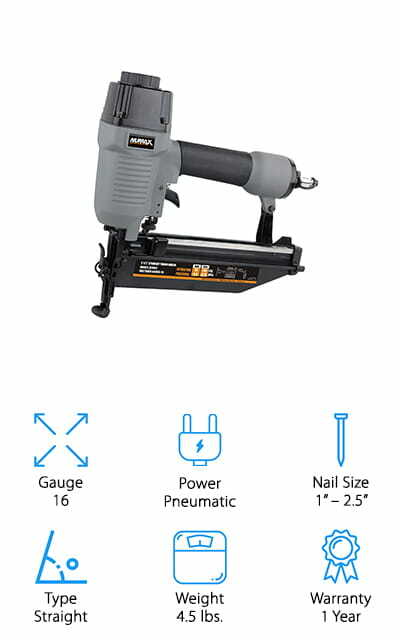 We like that this brad nailer can be used on both indoor and outdoor jobs, from installing base boards, laying flooring, and trim to tackling outdoor molding and staircases! You can easily adjust the nail depth to customize your projects and prevent nailing through surfaces where you don’t want it. We also like that it comes with a quick jam release you can use without the need for extra tools, so you can get back to work quickly. This nailer is also lightweight and has a handle that’s ergonomic, provides tons of grip, and is even vibration-resistant to reduce hand fatigue! The adjustable exhaust keeps your work area free of sawdust and debris while also preventing it from blowing right in your face – a major plus! If you’re looking for a brad nailer you can take with you on the job, this durable nailer from Wen will do the trick! We like that this nailer gives you the freedom to use 18-gauge nails from 3/4 inch to 2 inches, so you can use whatever nails are best for each task. You can easily adjust the depth with a dial, and the magazine has a window with markers that tell you how many nails you have left. No worries about dry firing – you can see clearly when it’s time to reload! This pneumatic nailer is lightweight and has a thick rubber handle to prevent fatigue – even after a long shift! You can change the direction of the exhaust, which is great for keeping your workspace free of sawdust and keeps the air out of your face! We think this is a great pneumatic nailer for professionals who need a sturdy, easy to use nailer for their job! 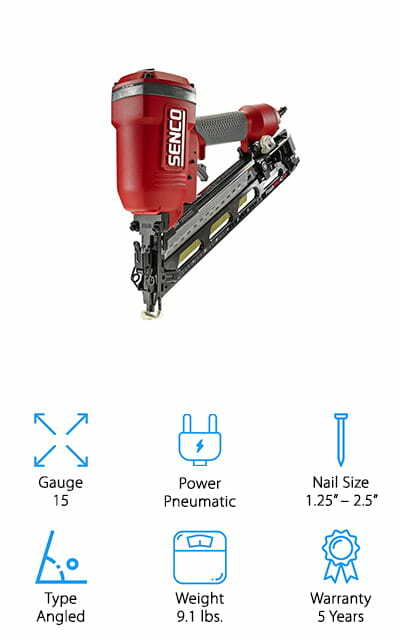 If you prefer an angled nail gun, this pneumatic brad nailer from Senco is great for large and small jobs! It uses 15 gauge nails, which are great for using on thicker pieces of trim like door framing, window framing, stairs, and more. You can use nails from 1.25 inches to 2.5 inches, so you can handle nailing in thicker pieces of wood securely and quickly. The angled design allows you to reach into tight, awkward spaces without worrying about banging your nailer into the wall. 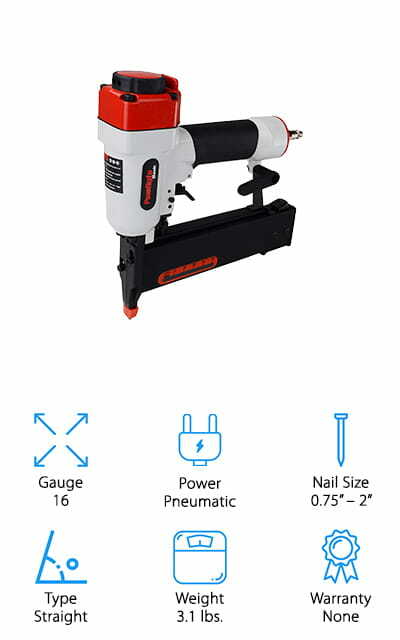 This nailer may seem heavy at 9.1 pounds, but it needs to have the weight and power to drive larger nails, so you’ll appreciate the steady control and balance of this machine. It also has an easy to use latch to clear out jams, and there’s an adjustable exhaust to keep the air out of your face while you work. 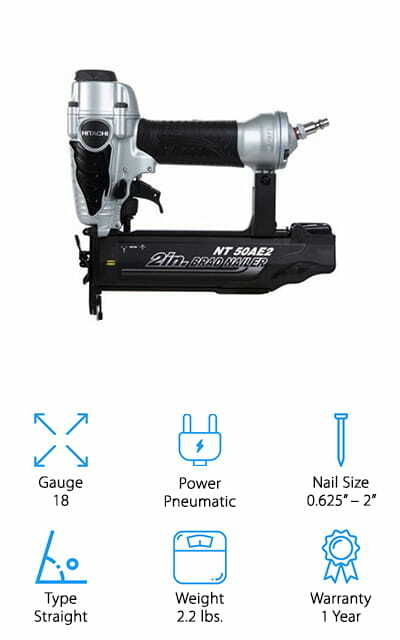 This is a great nailer to have on hand for your heavy-duty woodworking tasks! The final brad nailer we reviewed is this inexpensive pneumatic nailer from PowRyte that’s perfect for using on a wide variety of household woodworking projects! This 16-gauge nailer is great for installing all kinds of woodworking into your home, including baseboards, trim, molding, cabinetry, and much more. We like that this machine is lightweight and easy to handle, thanks to the thick handle with plenty of rubber grip for added control. This nailer also ensures your handiwork looks great, thanks to a thick no-mar tip that prevents the nailer from denting or scratching your surfaces. It also has a zero-nail shutoff that prevents you from “dry-nailing” air dents into your wood. The exhaust port is easy to adjust to any angle, and the tool hook allows you to hang up your nailer between tasks to keep it out of your way! We think this would make a great gift idea for the home improvement or woodworking enthusiasts in your family!